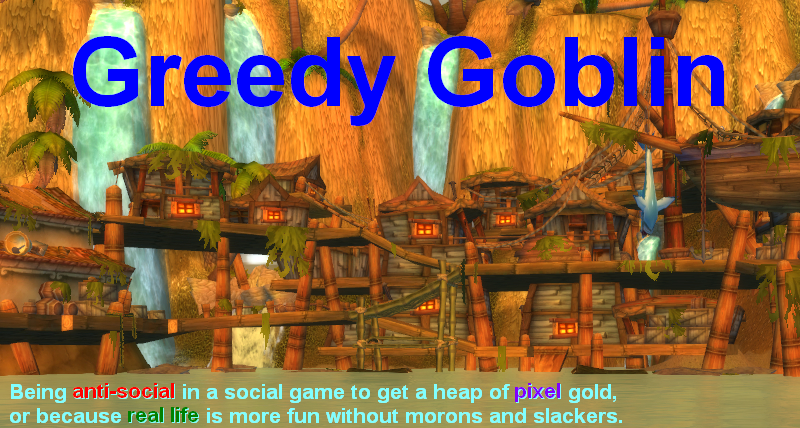 Greedy goblin: If there were no wardecs, what could a PvE corp do? If there were no wardecs, what could a PvE corp do? Non-wardeccable PvE corps are a long-standing idea of mine. Now let's see how their existence would change highsec moneymaking activities. Belt mining: newbies/casuals only. They would benefit from a shared corp Orca and Freighter. Any established multibox miner has his own Orca and Freighter as he can't risk that the Orca isn't online when he wants to mine. Ice mining: yes. As ice is limited, ganking/bumping competition and protecting own ships provides much better income, so ice miner corps would be a thing. However this means that the corp is mostly exists for (illegal) PvP. Mission mining: now yes, soon no, because CCP is planning on-grid boosting and that would remove the Orca from the mining missioners. Even if that doesn't kill mission mining, it'll make it totally solo. Contract hauling: yes. Red Frog and such could skip double-contracting. Gankers could also be bribed to leave them alone with no need for list of pilots: set corp blue, don't shoot blue ships. Hauling for himself (including distribution missions): no. This is as solo as it could be. Security missioning: only for newbies. Any established missioner is fine by himself, there is no point for sharing. Incursions: yes. Incursion communities could skip the administration by forming corps. Trading: no. Since trading includes no undocking, wardecs are already irrelevant, yet no trading corps formed. PI: no. There is no option to interact with the planetary colony of another player. POCOs must be in a wardeccable corp anyway. Exploration: no. It's as solo activity as possible. Oops. Besides help for communities that are already operating via channels, non-deccable corps would not affect any kind of moneymaking activities. So such corps would only affect the life of newbies/very casuals who need help to do activities done solo by veterans. It would also allow a social space for solo players. The point is that introducing such corps would not affect anything ISK-wise, it would be a vanity/social thing for the game, no harm would be done. This is what npc corps are for, and why new players start out in them. Plauers can make chat channels to talk to theie friends in the npc corp and others and have the same type of experience you are talking about. The corp structure works fine the way it is in my opinion. The risks ascociated with starting a player corp are wha make eve fun. Modern mining also requires POS with compression array (even if you take it up for one hour per week to compress a few freighters worth and take it down), so a mining corp cannot be a PvE corp without support from at least one-man "POS ops" player corp - I'm fairly sure POSes are not allowed in PvE corps. That, and hisec mining is getting rekt by coming ore rebalance anyway. The reason I object against "PvE corps" is that they are going to get used by PvF players (Player versus Freighter), which is a dumbest form of PvE, as there is no difference if freighter is piloted or not, and it carries below-zero risk. Until that activity gets a skill cap, "PvE corps" benefit it just too much, making me against them. The most risk-averse, laziest and stupidest of eve players - gankers - don't need yet another buff. They got more buffs than anyone in the last 3 years, they got so many buffs that ganking became #1 braindead activity of all eve. Thus, I say no to it not because pros are insufficient, but because that single con is unacceptable. Easy and simple: make Wardecs focus on Constellation or at least region. Those willing to fight (and those too dump to realize its war) will fight for that constellation. Those who don't want to fight leave the space and settle else where. no one needs to stay docked all day and hub denial and "this is my territory" fights are still legit. @Chanina: and how would it change the current situation? In both cases the smart attacked is annoyed and forced to hide, the dumb one is slaughtered. Either way everyone is better off doing PvE in an NPC or 1-man corp. Either way everyone is better off doing PvE in an NPC or 1-man corp.
indeed. and PvE is boring in EVE so until further significant improvment .. There will be no need for this kind of corp.